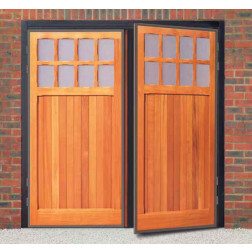 Popular “traditional” looking doors, our side hinged garage doors are both secure and durable. Similar to up and over’s, they are available in steel, UPVC, timber, GRP. All our garage doors, unless otherwise stated, come complete with lock/handle/fitting pack and full instructions. Side hinged garage doors also come with their own steel frame (that can be bolted directly onto the brickwork). Please note, all sizes are given in width x height; sizes are for the door only and do not include the frame dimensions. Glazing is available on some door designs constructed from shatter resistant polycarbonate with a stippled, transucent anti-reflectant finish. 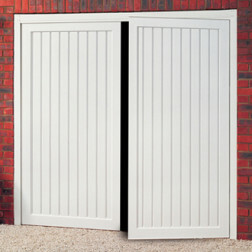 Cardale side hinged garage doors come complete with 50mm frame (50mm on the head). On a 2/3, 1/3 door you can request left hand opening for £50 extra. 2/3, 1/3 opening doors are R/H opening but can be made L/H opening at no extra charge. Our impact resistant white doors are the perfect match to uPVC windows and doors. It is “bounce back” material which makes it durable against knocks.